Black Pepper is an essential ingredient of the kitchen useful in treating a number of common ailments. It’s a bushy climber with strong branches and heart shaped leaves having small, round or oval shaped fruits available in clusters which are edible and rich with medicinal and natural healing properties. Let’s see some of the amazing health benefits of black pepper here on this page. black pepper contains active compounds that increase the motility of the intestines by stimulating the production of gastrointestinal enzymes. Black pepper contains flavonoids such as cryptoxanthin, zeaxanthin, carotene, and lycopene – powerful antioxidants which expel harmful free-radicals from the body. The pericarp, or the outer layer of the pepper, helps break down fat cells, making them easily absorbed by the body rather than becoming stored, unburned fats. 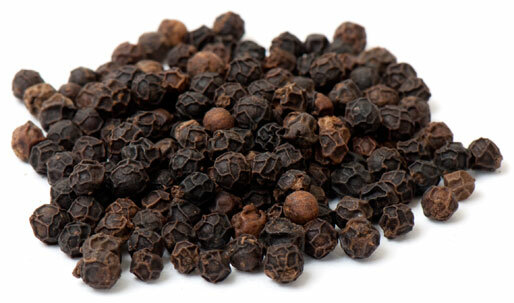 Black pepper has anti-bacterial and anti-inflammatory properties that can treat coughs and asthma. it is also an expectorant, which clears out the air passage by expelling phlegm. Black pepper effectively loosens up blocked nasal passage through sneezing and also relieves cold and sinusitis by curing the inflamed tissues. The active compounds found in black pepper promotes sweating and urination, which causes the toxins to be purged out from the body.